My nine-year-old learned about fractions with pizza. That’s such a yummy idea. 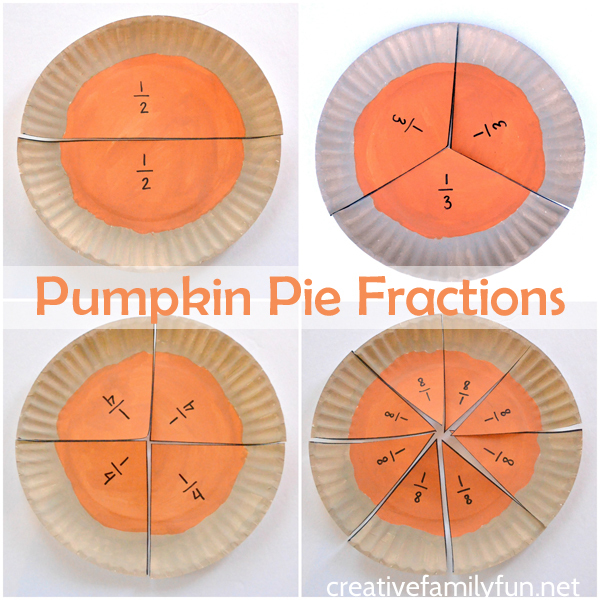 But now that Thanksgiving is coming soon, I needed to come up with another – but equally yummy – idea for fractions. I thought round and I thought delicious. I thought pumpkin pie. Pumpkin Pie Fractions. 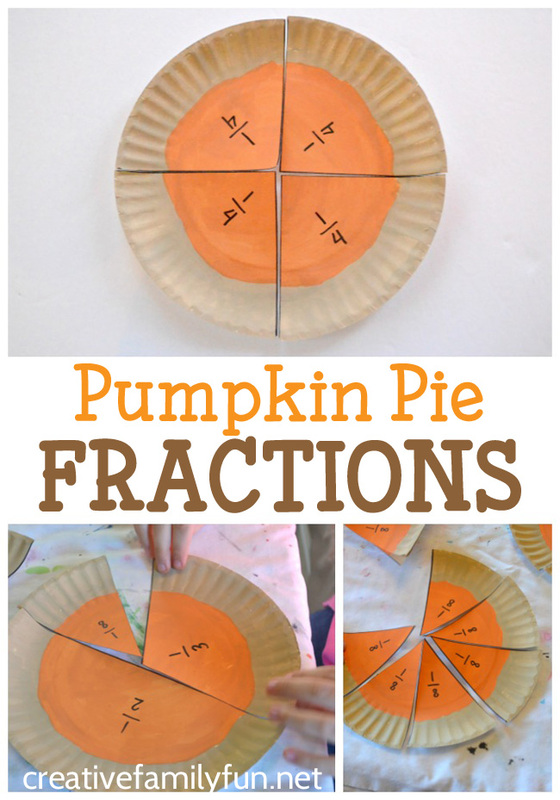 This Pumpkin Pie Fractions activity is so easy to create. Once you have it made, it will hold up for hours of hands-on math fun. Start with the paint. Use your light brown paint to paint the ridged edges of your paper plates. This is your crust. 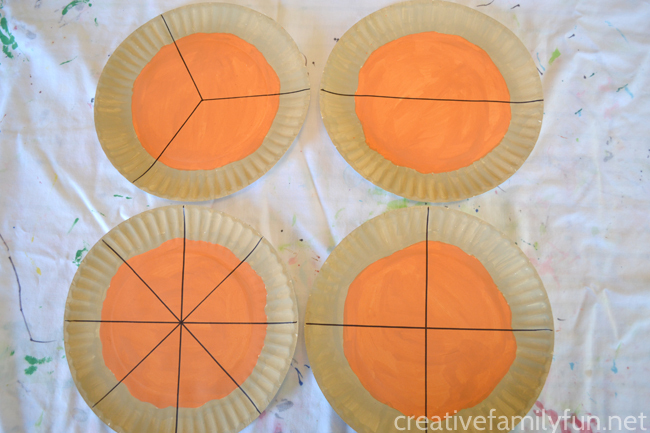 Next, paint the middle section of your paper plates with orange paint. Don’t worry about making sure your lines are straight. Remember, pies never look perfect! Once your paint is dry, use your ruler to divide the pie into fractions. One pie will be divided into half. Divide the second pie into thirds, the third pie into fourths, and the fourth pie into eights. Trace your lines with your black permanent marker. Label each of the pies with the corresponding fraction using your permanent marker. Finally, cut each pie along the dividing lines. Your pumpkin pies are ready! 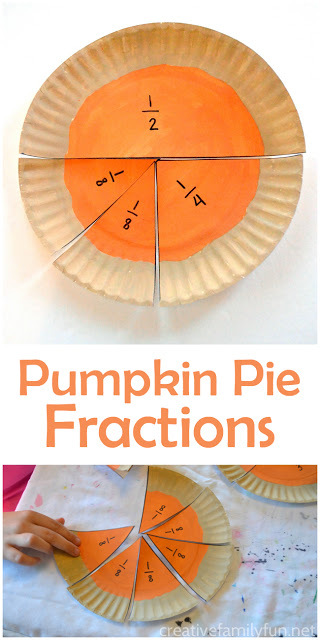 How can you play with your Pumpkin Pie Fractions? Give your kids a pile of mixed up pie pieces and have them put each pie together. They’ll have to match the type of fraction and then make a whole pie. This is a great way to easily see how many of each fraction makes a whole. Make equal pie wedges (make equivalent fractions). How many quarter pieces do you need to make a half piece. Use the bigger wedge as a guide to fill in with smaller pieces. 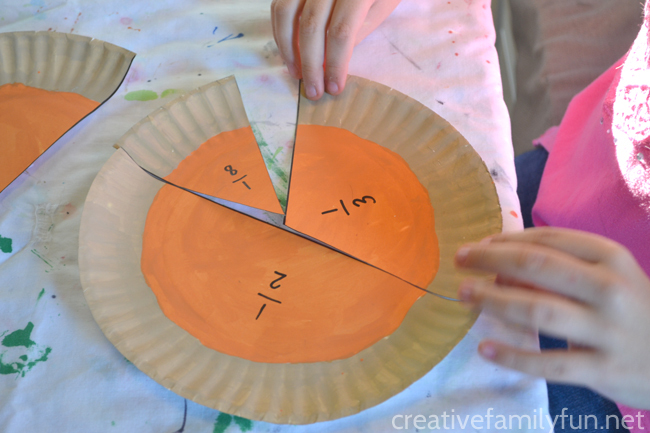 Make a mixed up fraction pie. Can you make a whole pie using different sized fractions? Let you kids experiment to find different combinations. 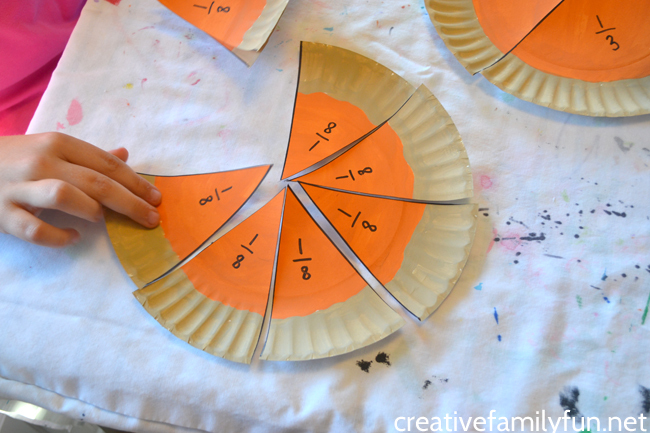 Build other fractions with your pie pieces. Make a 3/8 wedge by putting together three 1/8 wedges. Or make 3/4 with three of the quarter pieces. What other sizes can you make? Let their homework be the guide. What is your child working on in class? Use your pies as a hands-on tool to supplement their learning at home. If you need more pie sizes (maybe divided into fifths, sixths, or sevenths), just grab a few more paper plates. Let your kids lead the way. My girls set up a pie shop and sold all their different wedges. They had no idea how much they were learning along the way! I just sat back and let them have some fun. How would you use these Pumpkin Pie Fractions? Sometimes, as much as you want to prep a fun hands-on math activity, you just don’t have the time. That why I love having a few math games on hand. Here are some great options. Your kids will have so much fun that they won’t realize how much they’re learning. 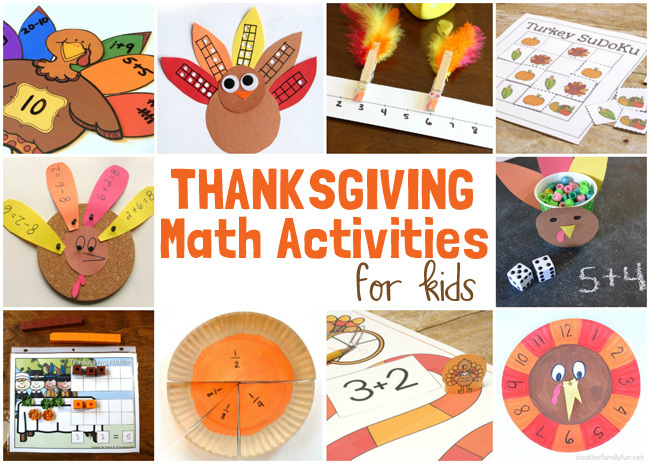 It’s time to combine some holiday fun with math when you play one of these awesome Thanksgiving math activities. You’ll find fun printable games and other hands-on ideas to practice addition, telling time, fractions, and more. Sounds like so much fun, right? Whether you’re looking for a simple printable math game or a fun way to practice math facts, just click through each link to get to all these fun ideas. I just know you’ll find exactly what you’re looking for here. Practice addition with our fun Add & Fill Turkey Addition Game. Learning to tell time is so much fun with our silly Turkey Clock. 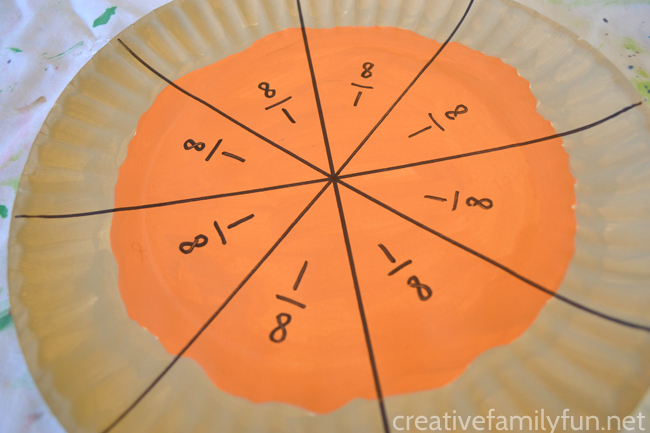 Explore fractions with this fun paper plate Pumpkin Pie Fractions Activity. Work on addition to ten with this fun felt Build a Number Bond Turkey activity at Life Over C’s. Practice your math facts with these fun Math Fact Turkeys at No Time for Flashcards. Race turkeys along a number line with this fun math game from Fun Learning for Kids. Create turkey feathers out of ten frames with this fun Turkey Ten Frame activity from Coffee Cups and Crayons. Practice your logic skills with a fun game of Thanksgiving Sudoku from Royal Baloo. Practice addition with this fun printable Turkey Trot board game from Royal Baloo. Roll a Turkey with this fun math facts game from This Reading Mama. Practice adding and subtracting with these printable Thanksgiving Addition and Subtraction Mats from 3 Dinosaurs. Develop your number sense with this fun Build a Turkey Math Game from Math Geek Mama. Word on multiplication with this fun Printable Thanksgiving Multiplication Pack from Royal Baloo. 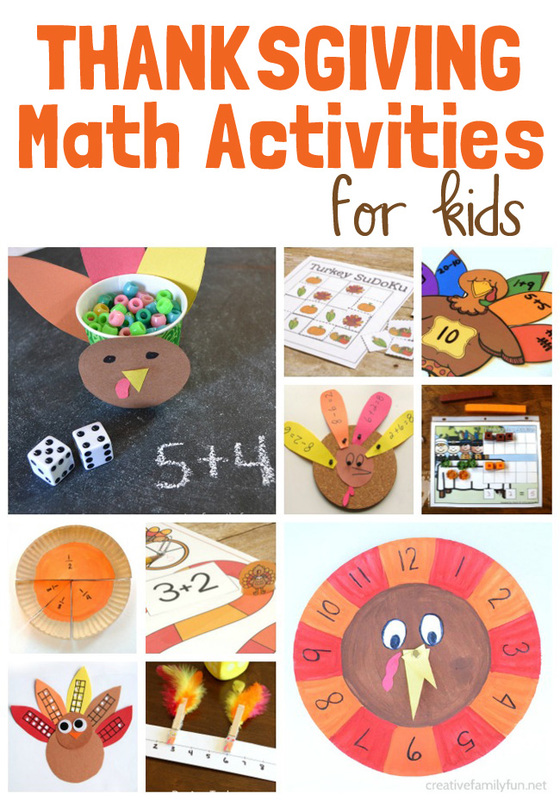 Which one of these fun Thanksgiving math activities are you going to try with your kids? How often do you talk about gratitude with your kids? I don’t know about you, but I don’t do it often enough. Every November, it hits me. We need to talk about gratitude. I don’t focus enough on it the rest of the year. It’s time to get on it. 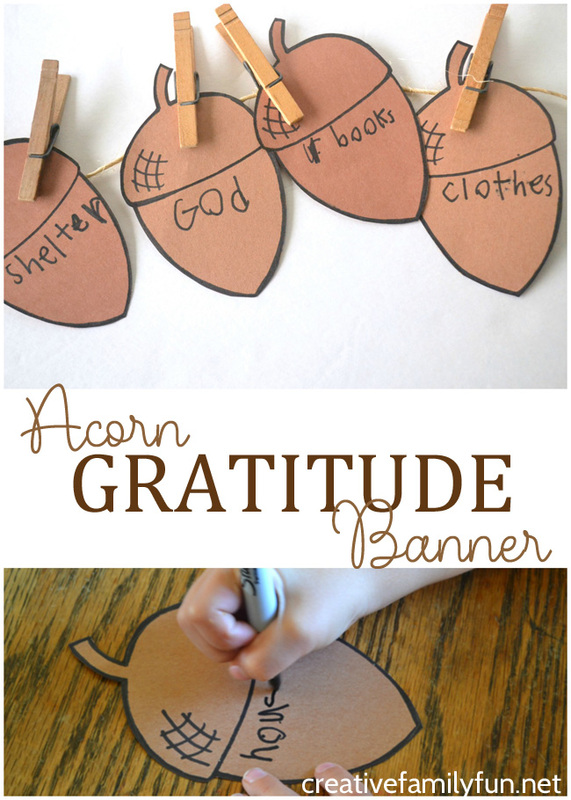 This Acorn Gratitude Banner was really simple to create. It got us all thinking about the things we are thankful for that we often take for granted. Plus, it turns into a cute decoration perfect for the Thanksgiving season. And, since I know you’ll want to make even more holiday crafts, check out all of our Thanksgiving crafts for kids at this link. We started with a pile of acorns. 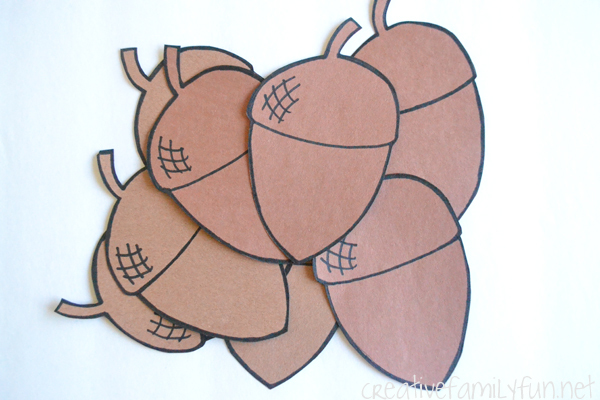 I used brown construction paper and drew some simple acorn shapes. I was able to get four acorns per sheet of paper. Once I had my acorns drawn, I traced each one with a black Sharpie to help the details stand out. We’ll be using these acorns to make our simple gratitude banner. I gave my girls an equal number of acorns and asked them to write something they were thankful for on each each acorn.They thought for a while, consulted each other, and finally chose the things they wanted to write. They were incredibly practical and listed such things as shelter, clothing, and beds. It makes me feel good to see that they realized these things that we so often take for granted and things to be grateful for. Once they were done, I clipped out acorns to a piece of twine with a few simple clothes pin. Make sure to use something sturdy like twine or rope because the clothespin will weigh things down a bit. I love the way our acorn gratitude banner turned out and I love that we can keep adding acorns to the banner as the month goes along. This was a great way to start that conversation about gratitude that I had been hoping for. You can continue the gratitude conversation with these printable Gratitude Conversation Starters. Make a cute Turkey Suncatcher Thanksgiving craft. Decorate the table with Cardboard Tube Pilgrim Hats. You can never have too many ideas for turkey projects. Am I right? 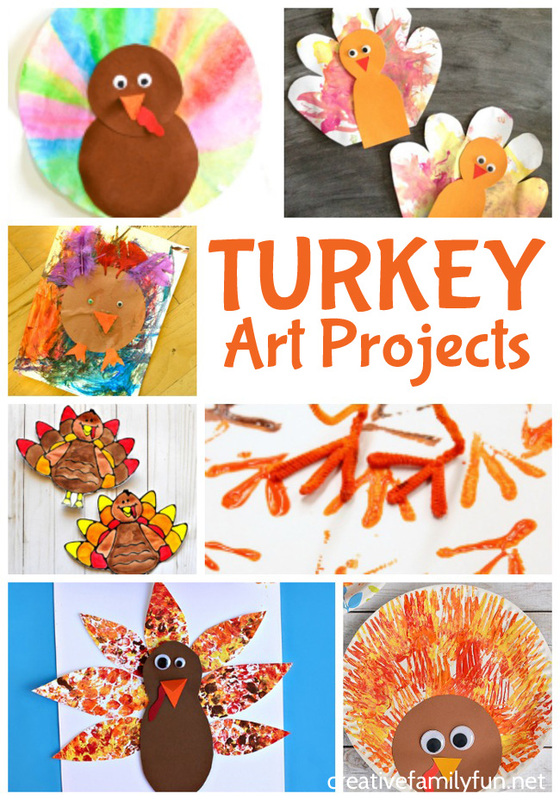 Get creative this Thanksgiving with these fun turkey art projects for kids. You’ll get creative, have some fun, and create some cute Thanksgiving art. I love that these projects use so many fun materials to create art. They’re all inspired by turkeys but allow you to be creative and focus on the process. 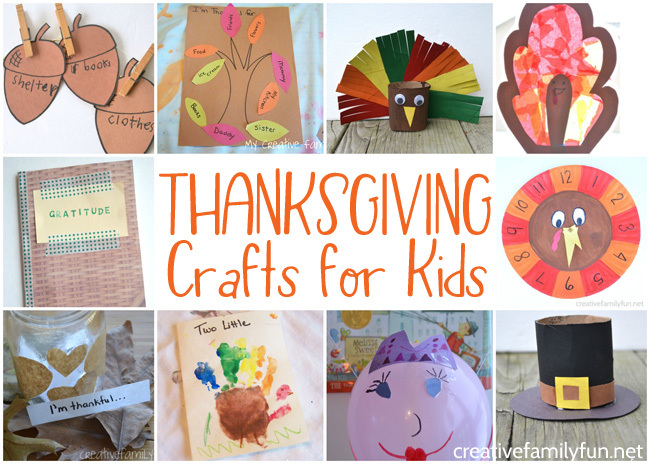 And, once you’re done making turkeys, check out all of our Thanksgiving crafts for kids. You’ll find plenty of fun activities to fill up your holiday season. 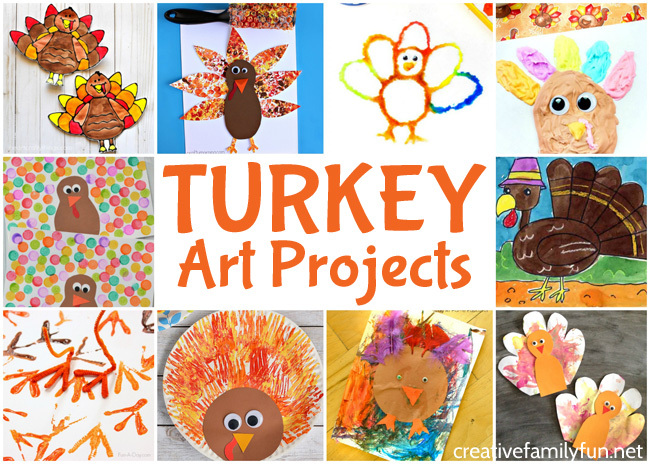 Keep reading below to find all of these fun turkey art projects. I’ve done my best to divide them by age, but I do think most of these projects will be fun for a wide range of ages. Which of these Thanksgiving art ideas are you going to try with your kids? Use fork painting to create the tail to this cute paper plate turkey from I Heart Arts n Crafts. Make turkey tracks art with this fun printmaking activity from Fun-A-Day. Create a turkey using DIY puffy paint with this fun art project from Natural Beach Living. Use your dot markers to create this Do-A-Dot Turkey from The Resourceful Mama. Get creative with feathers and paint with this fun turkey process art activity from Stay At Home Educator. Try printmaking to make this cute Bubble Wrap Printed Turkey from Crafty Morning. Paint with watercolors to create the tails on these beautiful Watercolor Coffee Filter Turkeys from Typically Simple. Try marble painting to create an awesome Marble Painted Turkey from What Can We Do with Paper and Glue. Paint with feathers to create these cute turkeys from Crafts on Sea. Learn to draw and paint a colorful Thanksgiving turkey with this guided art lesson from Deep Space Sparkle. Draw a cartoon turkey with this tutorial from Art Projects for Kids. Make a lovely watercolor turkey using this turkey drawing tutorial from Art Projects for Kids. Use watercolors and salt to make a fun Turkey Salt Painting from Natural Beach Living. Create with black glue to create a pretty Black Glue Turkey from I Heart Crafty Things. Turkeys, pilgrims, and gratitude. Those are the things I always think of once Thanksgiving rolls around. We’ve used all of these things in our crafting for Thanksgiving. So, when you’re ready to get creative and make some Thanksgiving Crafts for kids, I’ve got some great ideas for you. Make some fun turkeys or simple pilgrim hats. And, while you’re at it, find a fun gratitude craft to do. There’s plenty of fun ideas for kids of all ages from preschoolers to tweens. Use recycled materials to make this cute and colorful Cardboard Tube Turkey Craft. Don’t put away those recycled materials yet, you can also use them to make this cute Cardboard Tube Pilgrim Hat Craft. Decorate your window with this fun Thanksgiving Turkey Suncatcher. 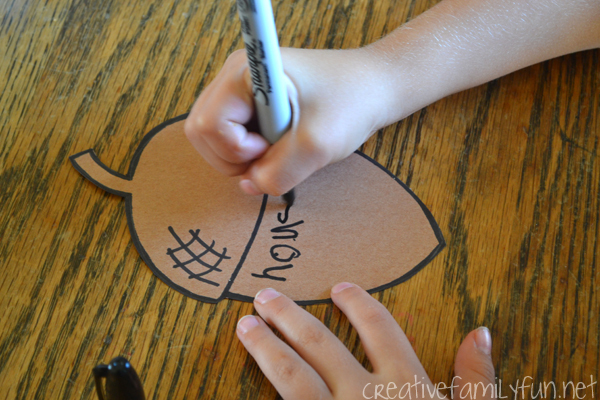 Make a fun Turkey Clock and use it to practice telling time. 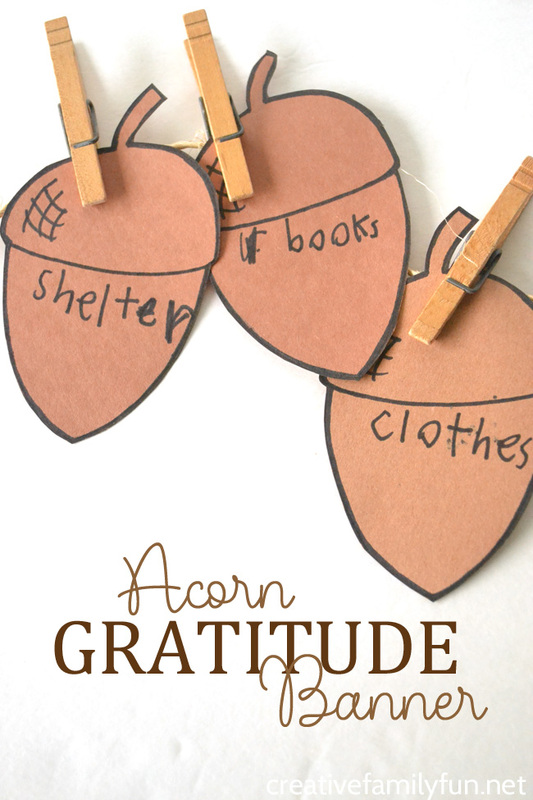 Use this pretty Acorn Gratitude Banner to display all that you are thankful for. Learn about the Macy’s Thanksgiving Day Parade and build your own parade balloon with this fun craft based on the book Balloons Over Broadway. Fancy a turkey craft? 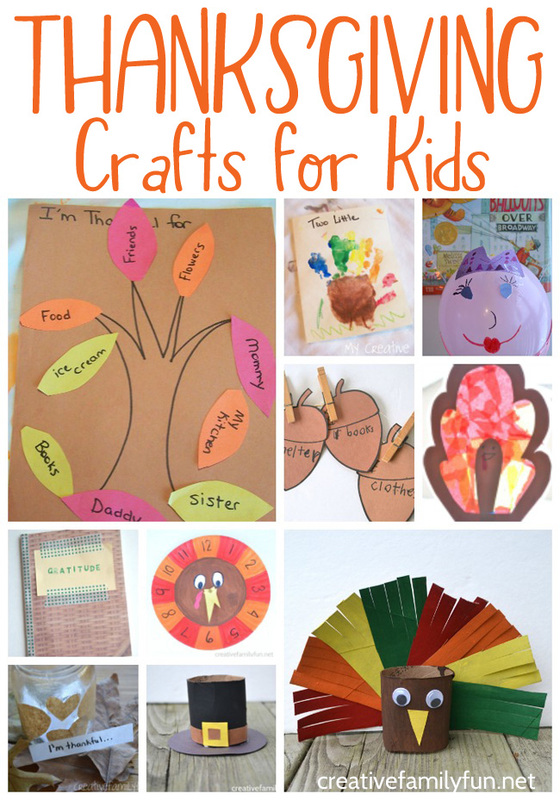 You’ll find several fun Thanksgiving Turkey Crafts here. 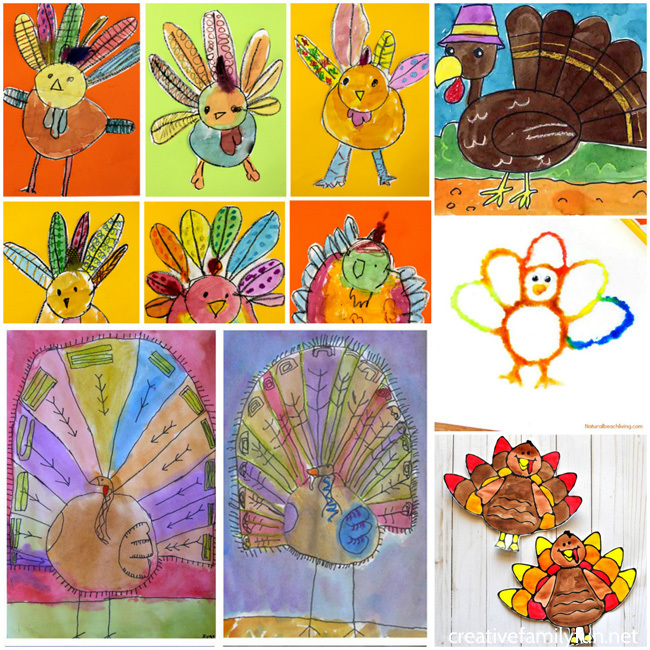 Try some Thanksgiving art with one of these awesome Turkey Art Projects for Kids. Make a simple DIY Gratitude Journal to record your thoughts all Thanksgiving season. Slip pieces of paper with the things you are thankful for in this pretty Thankful Jar. Or you can use if to store your Gratitude Conversation Starters. Practice saying thanks with these simple homemade Thank You Cards. Gratitude Leaves are another fun way to display what you are thankful for this Thanksgiving. Or you can make this simple Thankful Tree craft. 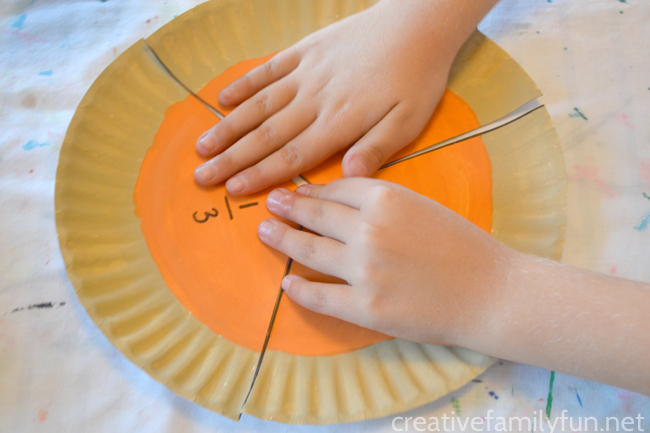 It’s a perfect Thanksgiving craft for preschoolers. These Handprint Turkey Cards are a fun way to send Thanksgiving greeting through the mail. Make sure you keep one for yourself too! Make some fun place mats for the dinner table with this craft based off the book In November. Try the simple thankful tree, turkey suncatcher, or In November place mats. Make a pilgrim hat, cardboard tube turkey, turkey clock, or a fun Macy’s Thanksgiving Day Parade balloon. Make a simple gratitude journal, a thankful jar, or decorate with the acorn gratitude banner. 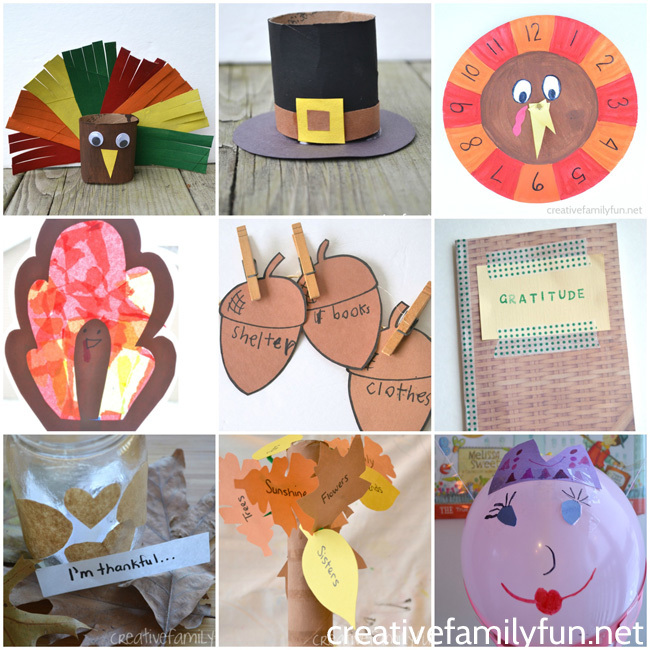 Which of these awesome Thanksgiving crafts for kids are you going to try this year? The Cutest Thanksgiving Toilet Paper Roll Crafts at Crystal & Co.